The Powder Ridge Ski Racing Program is committed to develop well-rounded athletes who exhibit exceptional technical skill, drive, and determination in an atmosphere of safe fun. Members will demonstrate the highest standards of teamwork and sportsmanship while competing in the Connecticut Youth Ski League (CYSL) and Tri-State Alpine Ski Racing Association(TSASRA). 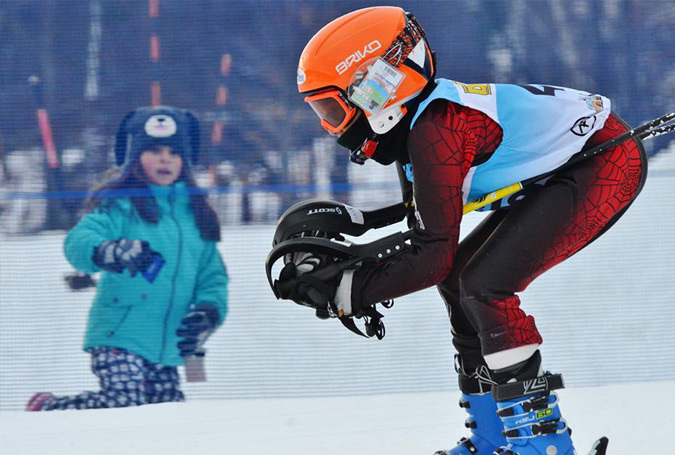 The team is an elite alpine ski racing program for children, ages 8 and up. Candidates will undergo an assessment of proficiency, attitude and commitment. Race Team is a demanding program, requiring significant commitment of time and resources. Members of the team are expected to attend every weekend practice, and optional weekday practices whenever possible. Practice begins in January, and the season can extend into March for racers who qualify for post-season competition. Travel for competition to other ski resorts is a necessity, as is membership in United States Ski and Snowboard Association (USSA), TSASRA and CYSL. The rewards of membership are significant! Team members receive outstanding coaching, resulting in significant improvements from season to season. Team members forge friendships with teammates and coaches that last a life time and learn to compete at the highest level while displaying unrivaled sportsmanship. All families who sign their child up will be asked to volunteer some time to help with racing events at Powder Ridge. Some of the volunteer positions will be gate keeping, timing, course maintenance, scoring, and registration. The Powder Ridge Race Team is a division of the Ski and Snowboard School at Powder Ridge, under the management of Director Tom Loring. We are currently interviewing coaching candidates and will be adding them based on team needs. Race Team members must be age 8 or older as of January 1, 2019. Candidates should have previous racing experience and/or be able to maintain open stance parallel or dynamic parallel turns down any race course set on blue terrain. Team participation requires the purchase of Powder Ridge season pass. (Purchase passes at the park.) Registration fees for coaching only are $775 for those 8 and-over. The Development Team is for all ages at a price of $575. Parents are responsible for association dues, race registration fees and travel costs. Registration is not complete without full payment for the program and the purchase of a season pass. Racers are required to maintain membership in USSA, TSASRA, and CYSL. Links for registration and renewals are supplied on your registration confirmation. Registrations are processed in the order they are received. Registrations must be completed no later than Nov. 28, 2018. Once we have received and verified your registration you will receive an informational packet from the coaches, which will include information about schedules, required equipment, USSA, TSARRA and CYSL registration information, etc. Email will be the primary form of communication for all race team information. Who should register for Race team? The coaches/instructors at Powder Ridge Ski Area will conduct an on snow evaluation on each athlete based on their maturity, technical ability, racing and competition experience to see if the athlete is appropriate for the team. In the event that there are no spots available or if your child does not meet the evaluation criteria, they will keep their position in our Developmental Program, on the Race Team track. By registering your child via our website you are agreeing to these terms and conditions. Download the Powder Ridge Race Team Code of Conduct. This Tri-State Team is a competitive alpine program set in a fun and challenging environment. It’s also for racers that are thinking about taking racing to the next level. You will have a bigger commitment to the program and will be traveling on weekends throughout the tri-state circuit. Alpine Team focuses on the foundation techniques and skills for all-mountain skiing through a combination of gate training, free skiing and on-snow drill work. The (Connecticut Youth Ski League) CYSL Team Program is a competitive alpine racing program set in a fun and challenging environment. This program focuses on developing ski racing skills while continuing to develop a passion for the sport of skiing. Coaches will have specific goals for development with thorough training progressions. Progressions develop foundational skills at a higher level through a combination of fundamental drill work, gate training, race simulation, directed free-skiing and ski racing. Technical and tactical skill-development will range from the basic, balanced athletic stance to elite exploration of new limits in specific events and terrain. Further development will focus on developing confident, race-day routines and behavior expectations, with positive self-talk, work ethic, and perseverance. The Development Program is a non-traveling race program that consists of a six week program of learning how to ski race on Powder Ridge. The program focuses on fun, foundational development through skill training, drills, giant slalom (GS) gate training and all-mountain directed free skiing, will also include an introduction to slalom (SL) gate training. Skiers develop sportsmanship, respect, and teamwork while receiving an introduction to alpine ski racing fundamentals, technique and tactical skill development, etiquette and competition arena protocols through participation in racing. Specific emphasis will be on a basic, balanced athletic stance to elite exploration of new limits in specific events and terrain while building confidence, positive self-talk, work ethic and perseverance.